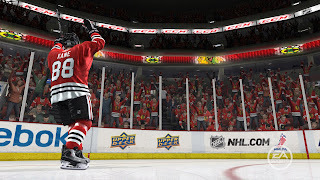 Developer EA Canada is back again for another season of some board-checking, puck pressure, and sure to be some thrown fists between players in the latest installment of the NHL franchise; NHL 10. 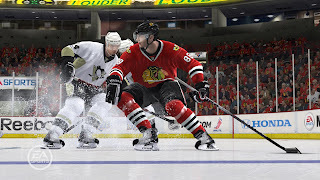 Said to offer over 200 gameplay refinements to allow for a more finesse game of hockey. From their press release, here are the top key features to look forward as we approach a September release date. Battle on the Boards - A new board play physics engine lets you shield the puck with your body along the boards, kick-pass it to teammates, or pin an opponent, adding a new level of realism to cycling the puck and the dump and chase. 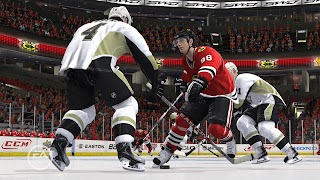 AI teammates will support the puck and help you win the battle as fans bang on the glass. Intimidation Tactics— Fore-check defenders, pressure the puck and finish checks to force your opponent into mistakes. Players fatigue, bobble passes, and avoid collisions under threat of physical pressure. Face wash a superstar to provoke the opposition, instigate a scrum and ignite the crowd. Post-Whistle Action—Now, the game never stops! Antagonize opposing players, finish checks, retaliate for late shots on goal, draw penalties and pick fights—all after the referee blows the whistle! New 1st Person Fighting Engine — Change the momentum of a game by trading blows with an NHL enforcer with all-new first-person fighting. Grab and tug an opponent’s jersey to land a big punch. Face wash an opponent to start a fight even after the whistle. New Precision Passing— A new 360° precision passing mechanic delivers control over the speed and direction of passes so players can bank passes off the boards or play the puck into space for teammates to skate on to it. Players take poor passes off their skates and kick the puck to their sticks. Spectacular Goals—Introducing spectacular new ways to score, like players one-timing loose pucks, stick-handling and shooting from their knees, batting pucks out of the air and lifting a leg to fake a shot on goal. Improved Goalie Intelligence —Goaltenders position themselves more intelligently, react to shots more quickly and recover from saves faster. 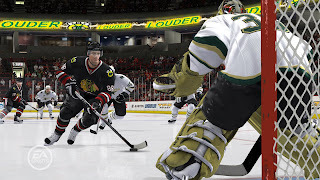 Plus, 250 new goalie animations, including swatting pucks out of the air, second and third saves and desperation lunges. Interactive Atmosphere— Playoff atmosphere pops to life with towel-waving fans, deafening noise and crowds that react and respond to the action on the ice. Fanatical fans bang glass during board play, spring to their feet after big hits, and boo opposing stars when they handle the puck. Next-Level authenticity— Over 200 gameplay refinements, including new offensive and defensive AI for more intelligent positioning, and new in-game facial animations that show player emotion when delivering bone-crunching checks or celebrating game-winning goals. All sounds like something I can really get behind - let us know if you're planning on picking this one up next month.